Some people have everything figured out – Andrea Nash is not one of those people. After being kicked out of the Order of Knights of Merciful Aid, Andrea's whole existence is in shambles. All she can do is try to put herself back together, something made easier by working for Cutting Edge, a small investigative firm owned by her best friend, Kate Daniels. 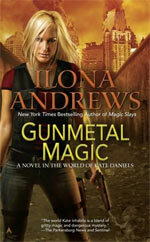 Gunmetal Magic is the first full length spin-off novel from Ilona Andrews’ incredibly popular Kate Daniels urban fantasy series. 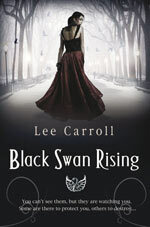 Set in the Kate Daniels world (Atlanta, a city ravaged by magic whose inhabitants live with weird and frequently dangerous supernatural manifestations when the magic is up.) Gunmetal Magic is narrated in first-person by Andrea, a beastkin shapeshifter who investigates magical crimes, monster manifestations and other mysteries with her best friend, Kate Daniels. It is hard to imagine that there are any urban fantasy readers left who haven’t succumbed to the pleasure that is an UF novel written by Ilona Andrews but just in case there are I’ll say this: Gunmetal Magic is a spin off from the main series so you could start reading here if you really wanted to, but why deny yourself the pleasure of some of the most imaginative and well written UF available? I’d recommend getting all the amazing world-building and background from the previous Kate Daniels books before starting Gunmetal Magic. The story starts with a snapshot into Andrea’s nightmares – an unsubtle hint that Andrea has suffered a great amount of physical abuse in her childhood. A quick monster hunt through the basement of her apartment building and the rescue of her neighbour before breakfast, reassures readers that what didn’t kill Andrea only made her stronger. The exciting opening chapter setting the pace and tone for the rest of the story. Andrea may be emotionally damaged and vulnerable but she can still punch harder, run faster and shoot straighter than the bad guys… resulting a fast-paced, action packed fantasy adventure that is enriched by Andrea’s character and romantic relationship development. Romance is provided by Raphael – Andrea’s ex-boyfriend. Fans of this series will have already seen the pair get together romantically but the relationship broke down through a set of unfortunate circumstances and misunderstanding. Raphael and Andrea are perfect for each other, but the course of true love never runs smooth when Bouda (hyena) shapeshifters mate. There is drama and passion and even more drama – giving an extra relationship drama dimension to the plotline when the pair are forced into each other’s company in order to investigate the murder of some of Raphael’s workers. There is a solid magical mystery to be investigated and along the way Andrea encounters an undead Viking giant, venomous snake people and an Egyptian deity. The mythology is artfully imagined and completely solid even though it is drawn from a mixture of pantheons and cultures. The story rockets along at a fast pace and there is never a dull moment, with Andrea and Raphael adequately filling Kate and Curran’s shoes for the duration of this story. Other secondary characters from the series get a chance to shine too, and in Gunmetal Magic it is Roman’s turn to share some of the limelight. Roman is a volhv, a kind of Russian druid who worships Chernobog, an evil Slavic deity. For an evil wizard, Roman is hugely likeable and provides much of the light relief for the story with his irrepressible good humour. The more that is revealed about Roman the more intriguing he becomes and I really hope the authors develop his character further in later stories. Gunmetal Magic makes a great addition to the Kate Daniel’s books. The Ilona Andrews husband and wife writing team pen consistently good urban fantasy. There is horror, dark violence, humour, imagination, wit and romance in every story they write. If this isn’t enough to convince you to get this book then I don’t know what more I can say… except that Gunmetal Magic comes with, Magic Gifts, a Kate Daniels novella included as a free bonus. Magic Gifts is over 100 pages long and narrated by Kate, the usual series protagonist. The novella enlightens readers to what Kate is doing which a severed vampire head in Chapter 5 of Gunmetal Magic. This parallel storyline is cleverly done and is a generous magical gift to series fans (but in no way as dangerous as the Magic Gift that gives the novella its name.) Great stuff!